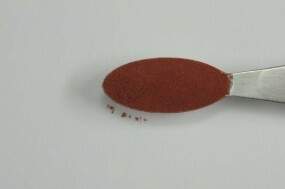 Burnt Iron Oxide Red, No. 10 | Iwa-Enogu® Mineral Pigments | Pigments | Kremer Pigments Inc.
For the last few centuries Japanese painting technique has made use of a new quality of pigments for watercolor painting and woodblock printing. This particular technique is called Enogu, for which pigments are made in exactly specified particle sizes - the particles are basically all the same size and shape. Colors of a unique particle size appear more brilliant. The sizes are given with the numbers: no. 8 = 50 µ, no. 10 = 27 µ, no. 12 = 14 µ, no. 14 = 5 µ. Customer evaluation for "Burnt Iron Oxide Red, No. 10"